From the massive campus in Bristol that houses the Worldwide Leader in Sports to the national championship-churning Women’s and Men’s basketball programs in Storrs to the WWE Corporate Headquarters in Stamford, Connecticut has become an unlikely cradle of sports highlights, information, and entertainment. What do Geno Auriema, Jim Calhoun, Ray Allen, Diana Taurasi, Maya Moore, Rebecca Lobo, Kemba Walker, Emeka Okafor, Ben Gordon, Richar Hamilton, Khalid El-Amin, Dan Patrick, Keith Olbermann, Bob Ley, Chris Berman, Stuart Scott, Rich Eisen, Scott Van Pelt, Robin Roberts, Linda Cohn, and Vince McMahon have in common? Connecticut served as all of their fertile ground for athletic achievement and multimedia celebrity. Each one of the aforementioned athletes and personalities is known for not only for their athletic, commercial, and/or journalistic accomplishments but also for their intense love of competition. In celebration of the same spirit of competition, enter your ZIP code to receive competitive car insurance quotes from the top carriers in the state of Connecticut. Finding the time to research all there is to know about car insurance companies in Connecticut and their rates and practices can seem like an impossible task. The good news is we’ve paved the way for you to get the information you want and need to make an informed decision about your car insurance. We will help you discover the key indicators that insurance companies consider risks and how you can mitigate those risks. We’ll help you to know what the state requires, what you may want or need, and where you can get it at the best price. Connecticut is a fault state, meaning that the person who was at fault for causing the car accident is responsible to compensate anyone who suffered harm as a result of the crash. $25,000 for bodily injury or death of one person in an accident caused by the owner of the insured vehicle, $50,000 for total bodily injury or death in an accident caused by the owner of the insured vehicle, and $25,000 for property damage per accident caused by the owner of the insured vehicle. 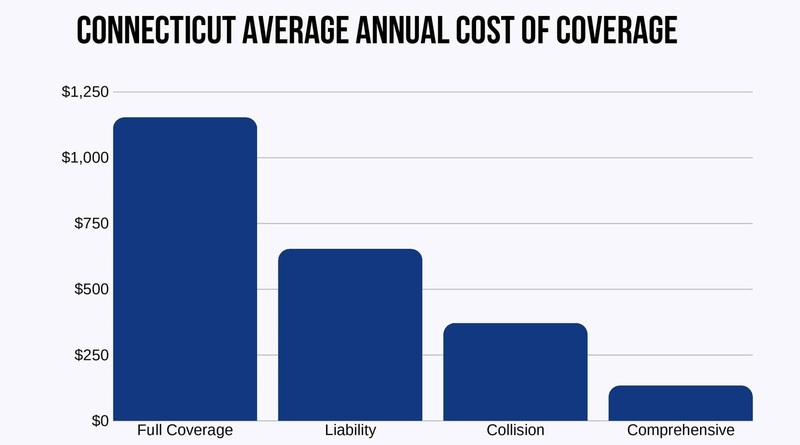 Connecticut does require you to carry Uninsured/Underinsured Motorist coverage so that you can protect yourself and your passengers and pay for any medical bills if the at-fault driver has no insurance, or if you’re the victim of a hit-and-run. How much risk are you assuming by only carrying the minimum amount of liability insurance? It depends on your monthly budget and on how exposed you want to be to potential litigation. If you have assets or future assets that you wish to protect, you want to consider increasing your liability coverage. Make sure you’re covered for an amount equal to the total value of your assets (Add up the dollar values of your house, your car, savings, and investments). Please be aware that basic coverage only provides you with liability protection; It will not pay to repair or replace your car for an accident that you cause. If you’re looking to repair or replace your car after an accident, then collision and comprehensive coverage are worth the investment. These policies come with a deductible and they pay out based on the current value of your car, not necessarily the price you might have paid for it. Self-insurance is available in Connecticut to individuals who receive approval from the state insurance commissioner by providing evidence of ability to meet financial obligations. Next, we will take a look at how much motorists in Connecticut pay on average for auto insurance. The amount you actually will pay may be slightly lower or higher than these figures, but this data will provide you with some context from which you can project your own situation with reasonable accuracy. That funny one-liner illustrates how taxes can affect one’s Disposable Personal Income (DPI), which is the money you’re allowed to keep after the government takes its portion. Now that we have examined facts about auto insurance costs to individual consumers, let’s take a look at some important statistics about the insurance companies themselves. First, let us examine the concept of loss ratio. What exactly is a loss ratio? And what is its effect on your premiums? The insurance loss ratio is the loss to the insurance company for claims that were paid out, divided by the premiums collected. A high loss ratio means that an insurance company has too many customers filing claims, which will subsequently lead to a rise in future premiums for all consumers. GEICO, the largest auto insurer in Connecticut, has a loss ratio of 75.82 percent. Typically, a loss ratio between 40 to 60 percent is considered standard. Too much higher would mean that a company is paying out too many claims and would have a hard time remaining solvent. However, if a company’s loss ratio is well under 40 percent, that means the company is pocketing much more money in premiums than paying out in claims or discounts to its customers. A little over nine percent of drivers in Connecticut (9.4 percent to be exact) don’t have insurance, which ranks as the 36th highest percentage in the country. As protection against those who drive without any insurance coverage, you may consider opting for additional coverage options to protect. One such option in the Constitution State is Medical Payments Coverage. Medical Payments Coverage, or Med Pay, is an optional coverage in all motor vehicle insurance policies in the State of Connecticut. You can purchase this coverage in the following amounts: $1,000, $5,000, $10,000, $25,000 or even $50,000. Med Pay insurance applies regardless of whether the insured or another driver was at fault. It even applies when the insured or the insured’s family are pedestrians on the street and are struck by another motorist. Despite the increasing popularity of pay-by-the-mile auto insurance plans offered by companies like Metromile, they are currently not being offered in Connecticut. Other Usage-Based Insurance programs (UBI) are active and available to drivers in Connecticut. Programs like Drivewise from Allstate or Snapshot from Progressive or Drive Safe & Save from State Farm offer discounts to drivers based on how well and how often they drive. Cyndi Lauper once reminded us: “When the working day is done, girls just want to have fun.” And there are few things more fun in Connecticut than saving money on car insurance quotes. In that context, let’s see whether or not girls are having more fun than boys when it comes to their insurance premiums. Take a look at the following table to compare and contrast. Here’s a look at the Most Expensive Demographic rates in Connecticut. Where do you fit in the equation? Are you on the higher end or lower end of the ledger? Do you now have a better idea of what car insurance cost you and your family in the Nutmeg State? That is a difference of $20,789.21 per year. As you can see, it pays to do your due diligence when shopping around for car insurance. There is no one size fits all insurer. A company offering the best rates for one customer may end up being the most expensive option for another. Where does your city rank statewide? Making sense of all the information while trying to decide on the auto insurance company that is the right fit for you can be stressful. Who’s going to give you the best rates? Who has the best customer service? Do you qualify for any discounts or upgrades? What special features and customer benefits, if any, can you earn? With so much data to consider and so many options from which to choose, making a sound decision can a bit mystifying. When deciding on a car insurance company, it is important to make a thorough examination of its public reputation. Understanding how a company treats its consumers and its responsiveness to customer complaints should be a crucial factor in the equation when you decide whom to trust with your hard-earned dollars. A company’s public reputation can often be a telling indicator of its business practices and the kinds of prices it offers to the buying public. We’ll show how the largest companies rate in the areas of financial stability and customer satisfaction. AM Best is a credit rating agency. It evaluates insurance companies and grades them based on their financial stability. The table below shows the ten largest insurance companies in Connecticut as measured by direct premiums written with their AM Best rating. For any relationship to endure the test of time, a reservoir of mutual trust and respect must be built. Both parties must have each other’s best interest at heart. Communication and expectations must be clear to everyone involved. If not, unrealistic and unfulfilled expectations will leave one or both parties having twisted feelings over the experience, leaving nobody feeling satisfied. Unfortunately, not every relationship will cross the finish line of satisfaction. When a consumer is dissatisfied, he or she can file a complaint. Those complaints, warranted or not, are factored into a company’s complaint ratios. The complaint ratio is how many complaints a company receive per one million dollars of business. If you wish to file a complaint against an insurance company in the state of Connecticut, use this online form. This chart gives a visual representation of the car insurance companies with the largest market share in Connecticut. Ever wonder how many licensed auto insurance companies are in Connecticut? The answer is 796. 67 are domestic to Connecticut, while the remaining 729 are nonlocal to the Nutmeg State. Now, we’re going to examine which carriers, on average, give the best rates statewide. Curious about how your credit history impacts the quotes you receive from car insurance companies? Consumer Reports conducted a study for Connecticut analyzing the effect of credit history on premiums. A married 35-year-old female will pay $1,810.97 on average with Travelers; while a 17-year-old single female will pay $13,987.79 with the same company. When it comes to comparing car insurance from various companies to get the best rates, don’t fall into the trap of picking a company that was right for a friend or relative because their situation may be completely different than yours. Instead, you should select the company that best suits your specific needs. It is best to heed the timeless advice of Fleetwood Mac: Go your own way! Choose the company that will provide the best rates and services for your present circumstance, not anybody else’s. The best way to ensure that you’re getting the best possible coverage at the best possible rates for your specific circumstance is to compare rates from multiple carriers. Another sure-fire way to make sure your rates stay as low as possible is to be a good driver. And being a good driver entails knowing the rules of the road and adhering to them. We’ll go over the laws of the land to keep you informed and your driving record spotless. Trying to memorize every traffic law in Connecticut would be both mind-numbing and impractical. We’ll help you to sift through the nonessentials and highlight those regulations which are most relevant Connecticut drivers. State laws have considerable influence on auto insurance. Each state determines the type of tort law and threshold (if any) that applies in the state, the type and amount of liability insurance required, and the system used for approval of insurer rates and forms. Insurance companies in Connecticut are subject to the regulations set by that state insurance commissioner. Ultimately, all rates and regulations must meet the fair competition standards set by the National Association of Insurance Commissioners (NAIC). “Open competition” is the capitalistic process in which rates are formed; however, if the insurance commissioner decides that rates are excessive or could be harmful to the company’s solvency, he or she will step in and adjust those figures. The SR-22 form must be filed by drivers who have committed violations or have multiple infractions, as well as uninsured drivers and others. If your license has been revoked or suspended, you may need to file an SR-22 to have it reinstated. The SR-22 form is available from your insurance company but it is not an insurance policy. If you do require the SR-22 insurance proof in CT, that means your license is or will be suspended or revoked and you cannot legally drive in Connecticut. Filing the correct documentation and meeting other requirements per the DMV can help you toward eventually reinstating your driving privileges. Please be sure to have the correct address on your driver’s license to ensure that you receive the notice. To see a list of other violations that can result in points or suspension, click here. Your license may be canceled for an incorrect or fraudulent license application or it may be canceled if a check written to pay driver license fees is returned for insufficient funds. Connecticut has no specific laws requiring insurance companies to offer special glass coverage or no-deductible windshield replacement. The Constitutions State does allow for a “Full Glass Coverage” option that covers broken safety glass, including windshields, with no deductible. You may have your car repaired at a repair shop to your liking, but you may be required to pay the difference. Connecticut allows insurers to use aftermarket parts, as well as used recycled parts, but they must inform you in writing. For a detailed summary of windshield and glass coverage in Connecticut, refer to this article. Insurance fraud is the second largest economic crime in America. Insurance fraud impacts premium rates and the prices consumers pay for goods and services. The department’s insurance fraud prevention division plays an important role in investigating suspected fraud. And if those fraud numbers continue to escalate it is more likely that the insurance will pass on some of that cost to you as the consumer in the form of increased premiums. If companies didn’t have to waste your premium dollars on false claims, you could see a reduction in the rates you pay. Insurance fraud is a crime no matter how you slice it. Even the “little, white lie” you tell to get a lower rate can lead to harmful consequences. That kind of willful misrepresentation of facts is called known as “rate evasion” and is $16 billion annual expense to auto insurers. Insurance fraud is a Class D felony in Connecticut. And according to a report by the Connecticut Insurance Department’s Insurance Fraud Unit, insurance fraud costs consumers in Connecticut nearly $2 billion annually. If you suspect insurance fraud or have been the victim of fraud, you can contact the State of Connecticut Insurance Department to report such activity. Connecticut’s statute of limitations for filing a claim is two years for personal injury and three years for property damage. Don’t make the mistake of driving in the state of Connecticut without proper registration and insurance. It would be unwise and potentially costly to do so. Connecticut’s DMV has an online portal where residents can perform tasks such renew their registrations and drivers’ licenses, update or change their address, and retrieve their driving history. Vehicle registration and insurance information can be easily accessed through the state database. The penalty for driving without insurance in Connecticut is as follows: A fine between $100 and $1,000 and license suspension for one month for the first offense with a $175 reinstatement fee. A second offense will result in a fine between $100 and $1,000 and license suspension for six months with a $175 reinstatement fee. For information on what the requirements are for financial responsibility in Connecticut, click here. Connecticut employs a Graduated Driver License program for young drivers, designed to reduce the high accident and fatality rate among teen motorists. In addition to that, the state of Connecticut has partnered with AAA to provide valuable safety tips and training for teen drivers and their parents/guardians. Learner's Permit: 16 years first 6 months—no passengers other than parents or a driving instructor; second 6 months—no passengers other than parents, driving instructor or members of the immediate family 11 p.m. - 5 a.m. Provisional License 12 months or until age 18, whichever occurs first (min. age: 17, 4 mos.) first 6 months—no passengers other than parents or a driving instructor; second 6 months—no passengers other than parents, driving instructor or members of the immediate family Nighttime restrictions will be lifted at age 18. Full License 16 and 4 months; have a mandatory holding period of 6 months; (4 months with driver education); have a minimum supervised driving time of 40 hours None. None. Furthermore, the Connecticut DMV has the Center for Teen Safe Driving which provides additional resources such as safe driving videos and sample content knowledge tests for drivers seeking extra training and support. Elderly drivers, ages 65 and older, have the option in Connecticut to renew their licenses every two years or every six years. All other drivers are required to renew every six years. Just like the rest of the general population, senior drivers do not have to show proof of adequate vision at every renewal. And just like the rest of the general population, elderly motorists are prohibited from renewing online or by mail; all drivers in Connecticut must renew in person. Once you have established residency in Connecticut, you have 30 days to transfer your out-of-state license to Connecticut. The State of Connecticut Department of Motor Vehicles handles all matters related to vehicle licensing. With your current driver’s license, the completion of a form, acceptable forms of identification, and payment for two fees, you will be licensed to drive in CT.
Read about special situations for new residents. Driver licenses must be renewed every six years. Renewals must be done in person. You should not wait until your license expires. Connecticut law requires that you keep right if driving slower than the average speed of traffic around you. Connecticut employs “Move Over” legislation, requiring drivers to move over and for emergency vehicles while simultaneously lowering speed as they pass. The law bars drivers from driving in the lane next to shoulders where emergency and nonemergency workers are present. Connecticut requires drivers and all front-seat passengers eight years old and older to wear a seat belt. A violation is not a primary offense. Passengers in the back seat ages 8-15 years old (or weighing 60 pounds or more) are permitted to use an adult safety belt. Not wearing a seat belt by itself cannot be a cause for your getting pulled over but should you be stopped for some other traffic violation, you can be ticketed for failure to wear a seat belt. The minimum fine is $50. Connecticut law permits passengers to ride in the cargo area of a vehicle for people 16 and older. Passengers 15 and younger are permitted if belted. Exceptions are allowed for farming operations, parades, and hayrides August through December. All children 2 years old or younger (or weighing less than 30pounds) are required to be seated in a rear-facing child safety seat. Children 2-4 years old and weighing between 30-40 pounds can be seated in a rear-or-forward-facing child safety seat. Children 5-7 years old weighing between 40-60 pounds may sit in a forward-or-rear-facing child restraint or a booster seat secured with a lap and shoulder belt. They are not permitted to use an adult seat belt under any circumstances. To date, no auto insurers in Connecticut offer insurance specifically for ridesharing services. The goal of all safety laws should be to ensure the well-being of all motorists and pedestrians on the road. The Connecticut Department of Transportation (CTDOT) has compiled a list of helpful safety resources regarding traffic and safety laws. One of those such resources is the Connecticut Highway Safety Plan. The Blood-Alcohol Content (BAC) limit in Connecticut is 0.08 percent; no High BAC limit exists in Connecticut. Criminal Status by Offense 1st misdemeanor, 2+ within 10 years felonies. 3rd Offense-DL Revocation license revoked, but eligible for reinstatment after two years. if reinstated, must only drive IID vehicle. This requirement may be lifted after 15 years by DMV commissioner. Currently, Connecticut has no marijuana-specific drugged driving laws in effect. Car theft is no laughing matter. Which cars in Connecticut are most popular to car thieves? Check out the chart below to find out. For your information, we’ve compiled a list of all driving-related fatalities in Connecticut. Connecticut, along with New York and New Jersey, forms a very congested tri-state intersection in the I-95 corridor of the Northeastern part of these United States of America. So, how bad is the commute look for the motorists of Connecticut? How does rush-hour traffic compare to the rest of the nation? What methods do they use to get to work? The answers to those questions are coming up next. At 24.9 minutes, Connecticut motorists almost mirror the national average of 25.3 minutes of commute time. Only 3.38 percent of Connecticut residents experience a “super commute” of 90 minutes or more. Now you have all the essential facts about Connecticut driving laws and insurance requirements. Make sure to put all that knowledge to good use to get yourself the best insurance quotes possible. Enter your zip code below to compare car insurance quotes and to declare your right to affordable car insurance from the top car insurance companies in the Constitution State.